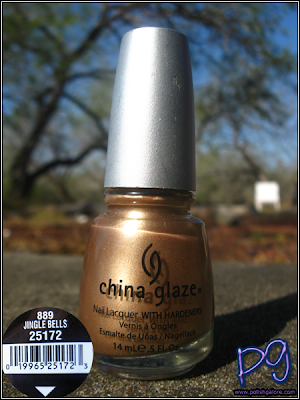 One of the last from China Glaze's 'Tis The Season is Jingle Bells, a champagne shimmer. Let's be frank, I'm not a fan of gold items - from jewelry to nail polish, but I'm always willing to try! In the sun, this is just a nice shimmer gold. it does seem a bit neutral against my skin tone. You can tell that the application was absolutely perfect. In the shade the color sticks out a little more but again it's a very neutral shade for me. Nice for a day at the office or possibly a business meeting but it doesn't scream me by any means. China Glaze did such a great job with the foils in this collection. I'm not a fan of yellow gold either but these two colors they did are beautiful. I only got midnight kiss.